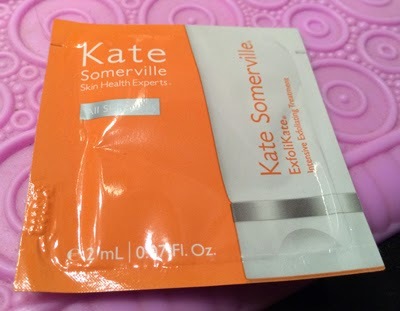 THE SKINNY: What I did not expect from Kate Somerville's ExfoliKate scrub would be that it was a seaweed green color in the packet. I also did not expect it to have a strong organic, yet medicinal smell. Combined, I was not at all impressed. It did seem to exfoliate pretty nicely although the formula was a bit too harsh for my sensitive skin. (It was a bit red afterward, but the label warned to use the "gentle" formula on sensitive skin. But the color and mostly smell, were just hard to overcome. And for something that costs a small fortune, I'll pass on future use. CHECK IT OUT: It's pricey but well liked with more than 10,000 loves at Sephora.com.